Image courtesy of Dean Kirby. 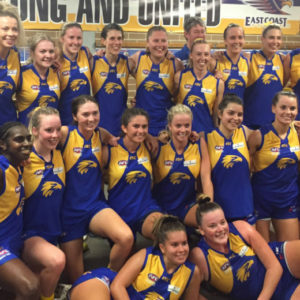 A massive upset was the highlight of the first round of the AFL Sydney’s Women’s Premier Division competition, which began over the weekend. Last year’s wooden spooners, the Western Wolves defeated 2017 Grand Finalists, the Sydney University Bombers by 36-points at Sydney University No. 1 Oval on Saturday. 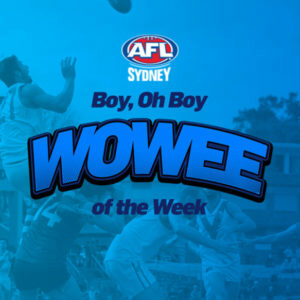 The Wolves led at every break and put the victory out of doubt in the second half when they kicked seven goals to the Bombers’ two. Wolves captain and GWS GIANTS listed player, Melissa Freckelton says she couldn’t be prouder of her girls in what was a perfect start to their season. 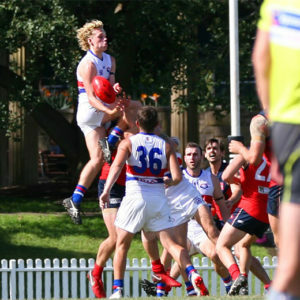 “We went in as the underdogs, which we were happy with, and we think we’ve sent a little bit of a message that we’ve had a pretty big shift in our team,” said Freckelton. Freckleton attributes the transformation of her side to the development of their younger, less experienced players. “Last year we had a lot of new girls come into our team, and you had a lot of new girls that had never played before. So we were trying to develop these girls and teach them, and get them up to speed, and there simply wasn’t enough time. 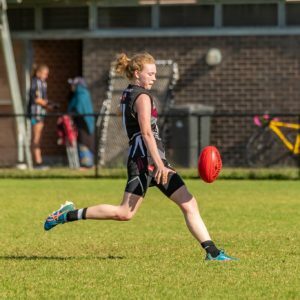 One of those second-year players is full-forward, Jessica Urquhart who kicked five goals on Saturday. Urquhart, who played the same position last year, only registered the one goal for the season. She has already smashed that total to become the leading goal kicker after round one. The former soccer goalie kicked most of her goals from strong marks inside-50. “She’s so strong and just has the safest hands,” tells Freckleton. 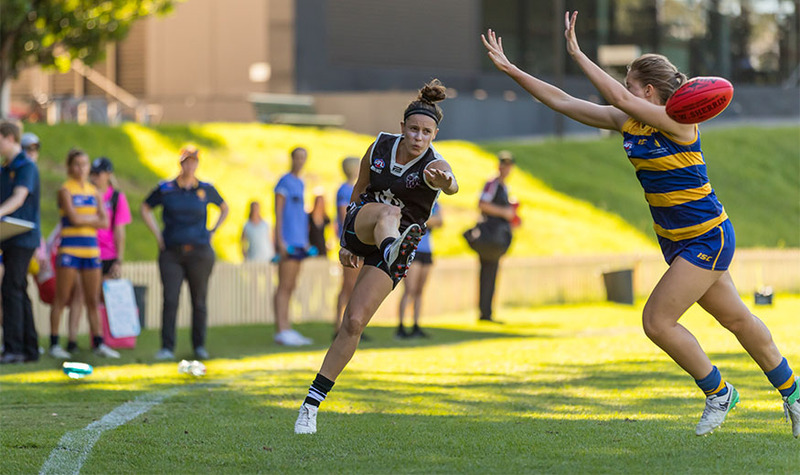 Freckelton returned to the Wolves after spending the past five months training with the GWS GIANTS’ AFLW side and was keen to put what she had learnt over the pre-season into practice. “My skills have definitely developed a lot. I felt pretty good out there, my hands and my kicking – it all felt good. Other GWS GIANTS, Erin McKinnon and Nicola Barr were missing from the depleted Bombers outfit. They will return to their local side once they have completed their post-season recovery program from the GIANTS. In other results on the weekend the Newtown Breakaways (8.5.53) defeated the Auburn-Penrith Giants (3.3.21), UNSW Eastern Suburbs Bulldogs (10.11.71) defeated the UTS Shamrocks (1.4.10) and Macquarie University (11.15.81) defeated the Southern Power (2.4.16). The Western Wolves will look to continue their winning ways against the UTS Shamrocks this Saturday in the opening match of Round 2. The game will be played at Picken Oval at 8.30am. Phoebe McWilliams is a current AFL Women’s GWS GIANTS player, who is also a freelance writer for publications such as Inside Football Magazine. Following the 2018 NAB AFL Women’s Season, McWilliams will be playing for the Hawthorn Football Club in the VFLW for the remainder of the year.